Located in Eisenhüttenstadt, Brandenburg’s Central Reception Camp for Asylum Seekers was originally designed to accommodate 800 people. But when Germany registered a dramatic increase in the number of asylum seekers at the beginning of the 1990s, the Einsenhüttenstadt facility had to temporarily house up to 2,000 people. In 1992, the number of asylum seekers in Germany reached its peak at 438,191. To make up for the lack of accommodations, authorities housed asylum seekers in containers like the one shown here. After 1993, the number of asylum seekers steadily declined due to practical restrictions on the basic right to asylum and the stabilization of Eastern Europe and other regions. 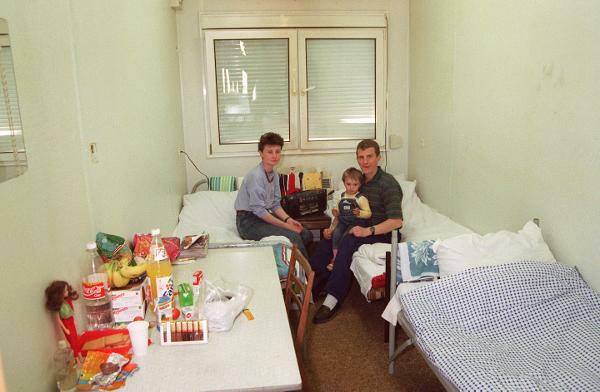 This photo shows a Russian family in their container in Eisenhüttenstadt, which once functioned as one of the GDR’s “model communities.” Photo: Karlheinz Schindler.